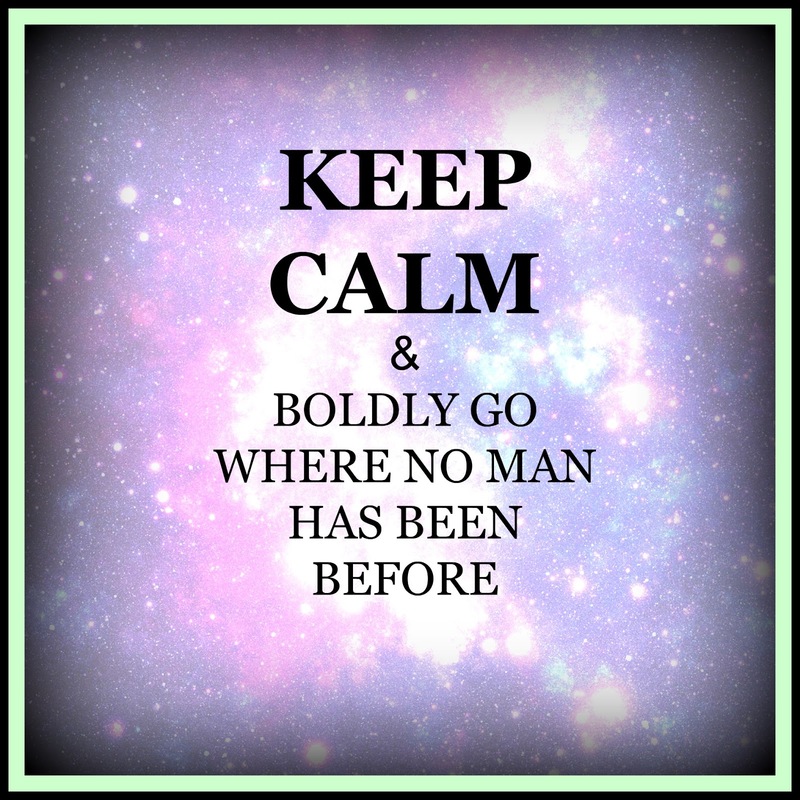 Keep Calm and Boldly go where no man has gone before. 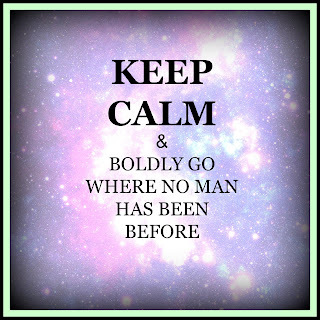 Are you prepared to boldly go where no-one has ever been before - and CALMLY too? The theme which comes up constantly in my blogs is SPACE. I used to love to watch the original Star Trek series on TV years ago now and like millions of others absolutely loved it. We'd sit there glued to the screen, and ready to embark on the ultimate journey into deep space, and to boldly go where no-man has gone before from the safety of our armchairs! Well folks I believe armchair space travellers aren't going to cut the mustard any more. Now is the time for action. It's a time when science-fiction and fact collide. No I am not thinking about 'Independence Day or even War of the Worlds' But it is time for us all to explore space that final frontier. We may not all want to launch off into the great blue yonder like our own astronaut Tim Peake, but we can explore space in a different yet complementary way; through meditation and self-awareness. And whilst the international space station is breaking down barriers up there in the heavens, we too can break down barriers, which have held us back, using meditation and self awareness techniques. If I go even further back, I used to listen to a radio programme called Journey into Space whilst tucked safely up in bed at night. It was thrilling and frightening all at the same time. My imagination used to run riot, but I loved all those journey's into the unknown. Change is a very natural part of man's evolution, it is programmed into our DNA! But sometimes fear causes us to retreat, when we are meant to keep right on going. When I say then that 'Space is the final frontier', it is a space where we meet the unknown head-on and in complete trust. We recognise that we can change the world, by owning who we are and that the potential we have to change the world for the good. Space isn't just out there. It isn't just the Solar System, or the Galaxies, or the Universes that spin within Universes, That same space is also an integral part of us all as individuals and so we too can fashion change for the good. The Universe was fashioned out of Space, just as we were. You could say the Universe is like a huge womb. And this is where the magic begins. Because just as the international space station is building bridges between nations, we too can work towards a bright new future by building our own bridges, by acknowledging at this level we are all linked each with each other. It doesn't matter where we live, it doesn't matter whether we are on the International Space Station or not, or whether we live in the farthest reaches of the Universe, or in the Outer Hebrides, we are all joined through the miracle that is space. But it is the way we view the unknown space that makes all the difference. In this world we don't know what's round the corner sometimes. But knowing we are all connected does have an impact doesn't it? And it is the way we communicate with one another in and through that space which makes all the difference. Which language are you going to allow to dominate you as we all take that giant step forward. Are you going to move slowly, gingerly and fearfully, or are you going to step up to the mark and go boldly where no man has gone before - LOVINGLY. For the international language we are all inching towards in spite of all the heart ache and sorrow is beyond words - unconditional love. This is the thread reaching out from deep space connecting all of us to each other. This is the thread that can create true and everlasting change for the good. To boldly go where no-one has gone before, is to allow yourself to explore Space, not fearfully but lovingly and without judgement. We are all one at this deep, deep level,. In this space we all speak one Universal language, and it is this Language which transcends all the words and languages,that causes endless divisions and conflict. The Universal language to be found in the silence of deep space.is.UNCONDITIONAL LOVE and compassionate love. Now is the time to Live in the Light of Love, rather than the every present shadow of fear. Life's a bit like a trapeze isn't it? 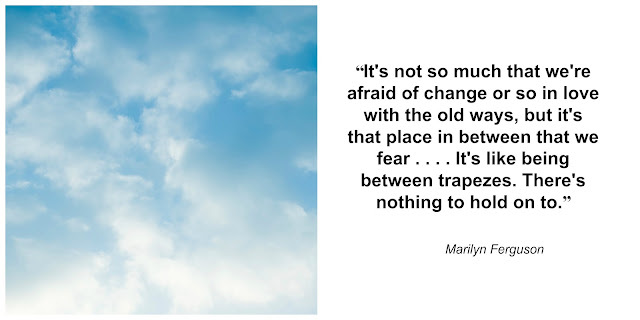 It's not so much the trapeze, more the bit in-between the two of them that's the problem and how we see that space! There's hardly been a day, when life hasn't taken yet another sudden twist and sometimes very ugly turn! It feels like the world is in free fall, and no-one knows what's going to happen next. We seem to be suspended in between two trapezes! As a small child, I used to love watching people swing between them. How thrilling it was, especially the moment when the artiste lets go, turning and twisting into nothingness! You know the point where she's suspended in mid-air. I remember my sharp intake of breath; we all gasped.. The suspense was quite something, almost like we were all hanging alongside her in mid-air. But do you know what? Some-how we never doubted the outcome! And it was always positive! We just knew she's reach out safely and connect with the second trapeze just at the right moment. I think that's an important lesson right now! The world seems to be in that in-between state right at this moment! A lot of what we took for granted is being swept right out from under our feet. Where's the security? It seems like there's nothing to hang onto as we go into free-fall. Fear snaps at our heels and we can either give in to it, scurrying for cover, or we can face it head on trusting that, although this is scary stuff we can do it! We are all in this together. Yes we are all very different people. We all have our hopes and dreams. In the final analysis we all want the same thing, we all want Peace and Harmony. We all want to feel free enough to express ourselves, and to live in the light of love rather than overshadowed by fear walking on egg shells at the time. We all have something to contribute to the whole wide whole, not just one tiny frenzied faction of it. As adults life has sometimes lost its magic: our glass seems very often half empty and very cloudy, rather than half full. So today I am going to make an effort to go back to that timeless space when even though our trapeze artist was poised between life and death, I never doubted she's come good in the end. I know I have the ability to come good! I know we all have the ability to come good! So yes the world is very much in an in-between two worlds, but it is the way we see this time that's going to make all the difference. We are all full of infinite potential. We all have the ability to come good, not by pretending its not happening but by addressing the problem.We can either propel ourselves into a much brighter future or scurry back to our bunkers for yet more of the same.